Rather than try to find a bar that not only fits with my expectations for function and quality, but also one which is cheap, I decided to build my own. After growing up in a household of DIY type people who are not afraid to get their hands dirty, I figured a project of my own design would be fun, challenging, and ultimately a learning experience. So after brainstorming a few ideas for features sizes with my roommates, Matt and Phil, I started sketching out plans for a new bar. The first step was unfortunately difficult–largely a result of my lack of skills. Before any physical work on the bar could commence, the plans needed to be solidified and the structure determined; and since I am lacking in technical drawing skills, I needed to rely on a CAD program to construct the blueprints. This is where the difficulty started. Trying to find a simple, free CAD program to do something basic like model the 2×4 construction of the bar was absolutely terrible. I eventually found a program called QCAD which did the trick. As you can see, QCAD is a 2D CAD program whose greatest asset is the simple click and drag functionality. Once I had a general idea of what I wanted and how it should be put together I scavenged my basement for scrap wood and inspiration (as any cheap yankee would). I found a pile of scrap hardwood floor which was left over from our renovations a couple years ago–figured it would make a nice foot board. The 2×4 was also lying around in a range of lengths, aside which I found some left over 1×4 fur which would look great with the hardwood flooring. It was a decent start to say the least. After drafting together the plan for the bar, it seemed like a three piece construction would work best as it would provide both a lightweight construction and transport possible. The bar would be made from 1) a base, 2) a top, and 3) a mid section of minimal material. It would be important to have solid connection between these parts, with emphasis on the mid section so as to prevent racking of the structure. The base was pretty simple since it consisted of 2×4 with cross members forming something akin to a wall. This was then wrapped with the flooring and fur boards to form a solid island for the bar. Off of that, six 2×3’s were used for the midsection and secured to the base through glue, nails and carriage bolts. The top was simply 1×12 and 1×10 which were glued together along with some mending brackets to provide rigidity and to prevent the glue from cracking. The top was then wrapped in 1×2 elm for a touch of lightness. The mid-section and the top were secured together with a couple of screws and glue. To finish off the bar, the top was stained with something dark, either walnut or espresso, and then sealed with clear poly. The base didn’t need anything more than a quick poly coat to bring out the color of the fur grain and to protect against moisture. For the mid-section I did something completely different. The mid-section represented something of a conundrum since I wanted the bar to be lightweight so any typical siding wouldn’t do. Instead I found that a combination of chicken wire and cloth provided for both the structure and visual appeal. The chicken wire was, of course, a challenge to work with; but with some patience and perseverance it made for a decent siding with some rigidity. The chicken wire provides the prerequisite defense against unintentional knocks and kicks into the shelving inside. By wrapping this wire beast in a red velvet cloth, the whole appearance came together. 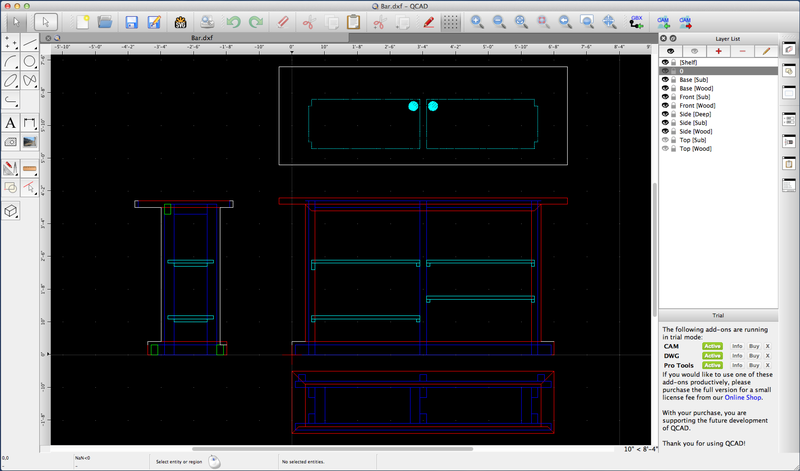 And for those interested in seeing the pdf version of what I had originally sketched with QCAD take a look at this.